Goga Pancham is observed mainly in North India and is associated with Naga worship. Goga Panchami 2019 date is August 20. It is observed on the fifth day or Panchami during the Krishna Paksha (waning phase of moon) of Bhadrapad month as per traditional calendar followed in North India. 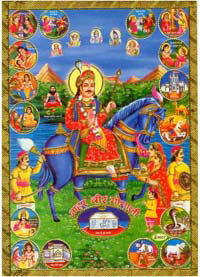 The most important festival associated with Goga is observed four days later and this is known as Goga Navami. The rituals on the day are dedicated to Guga – a holy person who had the power to heal persons bitten by snakes. There is a popular belief that children will be protected by Guga. So married women pray and perform pujas for the long life and health of their children on the day. Childless married women pray for begetting children.